One thing I've learned about my daughter is that she loves to climb under all types of tables and chairs. I wanted to give her a place of her own and crafted a little reading nook in our living room for her. The ingredients for this little DIY project are simple. This is a great nap time project since having your toddler trying to grab your scissors is really annoying (I learned the hard way). Spread your tablecloth over the folding table and cut a triangle out for the doorway. Then gather the sides towards one of the front table legs, cut a slit in the tablecloth behind the leg, and slip a length of ribbon through it. Tie a knot and a bow to hold back the extra tablecloth. Do this again on the other front leg. For the back legs I simply gathered all the extra material until the sides were smooth, cut slits on both sides of the table legs, wove the ribbon through, and knotted and tied it to keep the tablecoth in place. If you want to get creative, you can cut out a fancy 4-pane window on the side; however due to my toddler's desire to pull on things, I opted just for a rectangular window that she could peek out. The last thing to do is to lay a blanket or old pillow inside along with your child's favorite books. Hannah spent about 30 minutes just going in and out and looking at me through her window. When she's tired of it and big enough to use the table for drawing, I'll remove the cover, but for now, it's her own little reading nook. It turns out that my mom is a really good source of quilting jobs for me. Many of her friends are becoming grandparents and are looking for special, personalized gifts to give the new additions to their families. That's how this airplane quilt came to me. 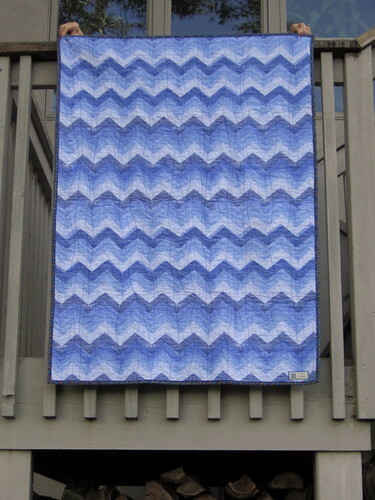 A friend and neighbor asked if I would make a quilt for a new grandson, and if I could make it blue with some sort of airplane theme to match his room, that would be great. After some searching both online and at my mom's local quilt shop for airplane fabric, I discovered that airplanes just don't seem to be "in" now as far as childrens' novelty fabric goes. Space ships? Sure. Dump trucks? We got 'em. Cute little cars on city streets? Take your pick. But airplanes, not so much. So I abandoned the idea of using airplane fabric and decided instead to make my own airplanes. I collected a variety of blue, white, and red prints for the airplanes and used two light blue prints (which have been living in my fabric stash for ages) for the block backgrounds. I considered a straight layout with sashing, sending all the airplanes flying in the same direction, but in the end I decided to let go of some of my usual structure in layout. My design wall was a great help, as it allowed me to place the airplane blocks in the directions and pattern I wanted and then fill in the space in between with red and blue solids. I'm new to improv quilting, so this is as improv as I get right now. I created the quilt top in 3 columns before sewing them together and trimming the whole thing down. The blue chevron Dear Stella fabric that I found for the back may be my favorite thing about this quilt. 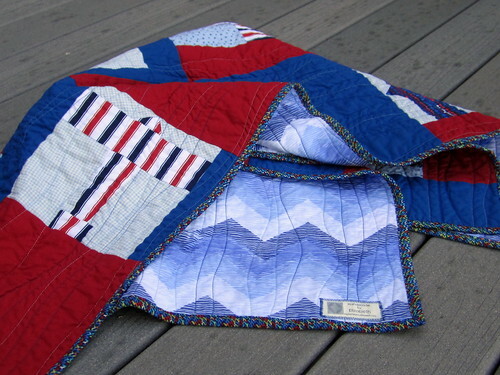 The colors are perfect, and it adds the right amount of fun to this baby quilt. Plus it feels so soft and silky. 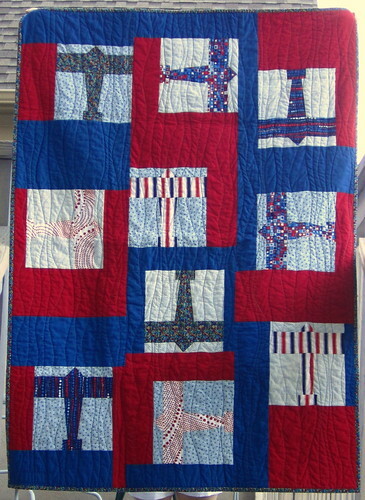 I quilted this one with organic wavy lines in two colors of blue thread. This is a quilt that I currently have in progress, commissioned by a childhood friend of mine who is expecting Baby #5 (!!!). 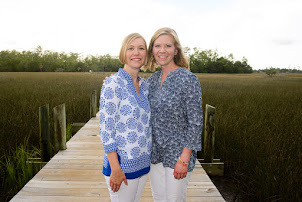 Chrissie and I were best friends like only little girls can be, until my family moved out of state when I was 9. When letter-writing and long-distance phone calls were the only way to keep in touch, we gradually lost contact. But thanks to Facebook we have been in contact again after many years, and I gladly accepted the baby quilt commission when she asked. Chrissie told me that she'd like to focus on grey for her baby boy, with pops of lime green, orange, and aqua. 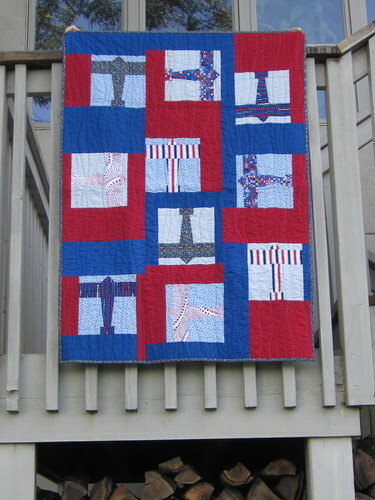 I sent her a few designs to consider (all from one of my favorite quilt bloggers Film in the Fridge), and she chose this "Flying Farfalle" design. You can see the original by Film in the Fridge here. For inquiring minds, I started with 6.5" blocks of Kona Medium Gray and added a selection of prints to opposite corners. The layout is 7 blocks by 9 blocks. I haven't yet figured out what I'll do on the back, but first up is getting these blocks into rows and those rows into a complete quilt top. 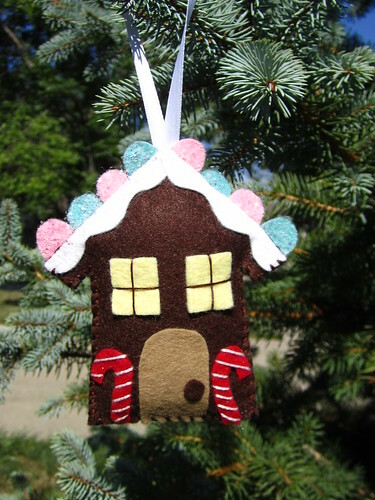 This month's theme for the ornament challenge is SNOWMEN. During these hot summer days, it's nice to think about the chill of winter and a nice fresh blanket of snow over everything. Keep an eye on the blog this month to see what we create! A couple of weeks ago I went to TN for a short visit, and while I was there I convinced my mom that she needed to make a July ornament too. 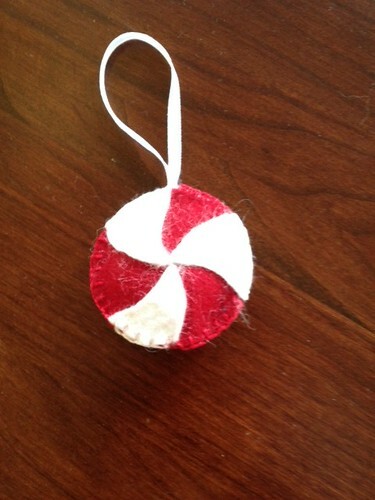 She came up with this simple peppermint swirl candy that I think will look sweet on the tree come December.